For this gardening post, I get to share our famous carrot creature! This is what happens when you don't thin your carrots properly. Yes, I'm guilty of that this year, but you must admit, the consequence was quite fun in this case! Meet the Octopus carrot. . . Photos courtesy of 9yo Miss G, who was thrilled about this carrot! We've been making this salsa about once a week at our house and it disappears so fast! Throw everything in the blender--tomatoes first. If you have a high-powered blender or BlendTec then you don't need to chop anything, just toss it in. Pulse to desired consistency. Enjoy! This salsa isn't super burn-your-face-off hot, but it has a nice zip. My kids still think it's too hot, but I think it's just right to keep you salivating for more. You'll note from the pictures that my salsa isn't very red--this is because I blend all the ingredients together. If you want yours to look red, then you could try blending separately or chopping. We really like the texture of this salsa. I could drink it folks--it's so good! As a wedding planner, I've smelled a rose or two but life never seems to slow down! I love this time of year and the roses in front of my shop are still blooming. Here's a few tips to help you enjoy those flowers of romance a bit longer. Deadheading roses--If you aren't out trimming them for glorious bouquets then you need to keep up with deadheading your roses. Once the bud is spent, wilted, petals are falling off, go ahead and clip that rose off. Take your little hand pruners and find a shoot of leaves that has 5 leaves--Count them, there will be 5--cut the stem right below the first grouping of 5 leaves. This prevents the plant from expending energy into the preservation of that particular blossom and it also helps with insect control. Clusters of blooms--How to deadhead? If you have an antique rose or other variety that blooms in clusters, you can't identify the true leaf or group of 5 leaves. In this case, it is best to concentrate on removing the spent blooms, pruning the plant to encourage the best production. Check for insects--When you are out in your rose garden, trimming or smelling, turn over a few leaves and examine them for presence of insects. Some roses have problems with white mealy flies, aphids, and other small insects. Sometimes spraying them with water will dislodge the critters but other times you'll need to rejuvenate your soil, overall rose health or use a spray for the pests. These tips will keep your roses producing throughout the season. Most important, IMO, if you don't stay up on deadheading, the blooms will diminish. This has been a busy summer for Pyper's Dream Weddings and my roses have seen some neglect, but even with the little bit I've been able to do they are still blooming for me. So, stop and smell the roses, but remember to deadhead too! My family loves pizza, as do most families, and with the economic crunch maybe you're looking for ways to still enjoy your favorites but pinch a few pennies at the same time. Have you decided maybe you can't afford to grab a pizza every week or every month like you're used to? No reason to stop enjoying what you love when you can make it yourself! 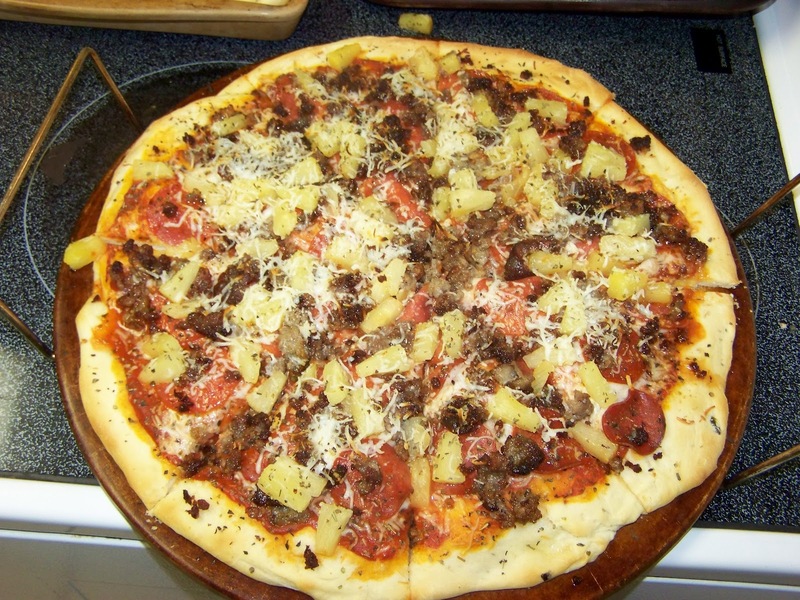 Now, I've tried lots of homemade pizza recipes and what I usually found was that although the crust was tasty, it was oftentimes too thick and bread-y. And we always had the problem with keeping our supreme pizzas from being soggy from all the water off the vegetables. Well, we've solved that problem and have been enjoying homemade pizza using this recipe for the past three years! The secret to success for us was to roll our crust out thin. It raises, but we still like it on the thin side because it doesn't go soggy and pizza is wonderful for leftovers. The other secret is the high heat * You must bake at a high heat to have success. I recommend baking at 500 degrees or higher if you're using lots of fresh vegetables. 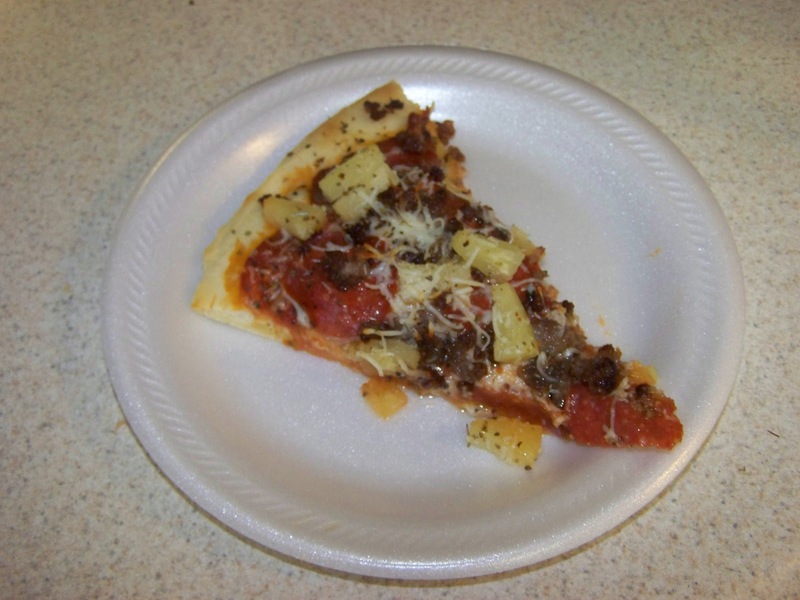 This cooks it up perfect and the moisture from the vegetables doesn't make your pizza soggy. I'm so nice I'm going to share my recipe with you. This is a combination of several different recipes we tried, then my husband and I did a little tweaking and perfecting to get it just right. So here goes....follow the recipe and have fun! I make 2 pizzas and breadsticks with sauce for around $5.00--could be less depending on what toppings you choose to use. Combine and let sit for 1 hour. I like to double the sauce recipe so that I can have extra sauce for dipping breadsticks later! Put yeast, sugar, salt, and dry milk in a large bowl. Add water and stir to mix well. Allow to sit for two minutes. Add oil and stir again. Add flour and stir until dough forms and flour is absorbed. Turn out on to a flat surface and knead for about 10 minutes. Divide dough into three balls. Put 3 ounces of oil in each of three 9-inch cake pans, making sure it is spread evenly. *But I use my Pampered Chef stones. I use a large bar pan and a 15 inch circle stone to cook two pizzas, then I use my 12X15 rectangle stone to make the breadsticks. Using a rolling pin, roll out each dough ball to about a 9-inch circle. Place in cake pans. Spray the outer edge of dough with Pam. Cover with a plate. Place in warm area and allow to rise for 1 to 1 1/2 hours. Spoon 1/3 cup sauce on dough and spread to within 1 inch of edge. Distribute 1 1/2 ounces shredded mozzarella cheese on sauce. 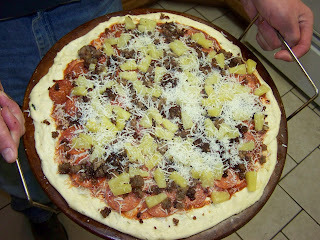 Top with 3 ounces mozzarella cheese. Cook until cheese is bubbling and outer crust is brown. Cut into slices. How to keep the water from boiling over when you're cooking pasta. Simple! Just add one tablespoon of olive oil (or oil of your preference) to boiling water. Stir in with pasta. That's it! Now, whenever I cook pasta, I set the time and walk away. I don't have to worry about messy spills or pasta water burning on my stove. Yee-haw!